Did You Know These Facts About Matt Mullenweg’s Life Journey? 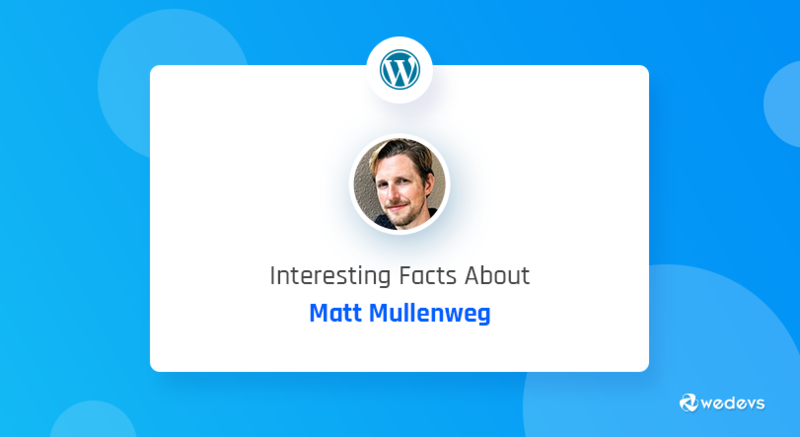 Matthew Charles Mullenweg or simply Matt Mullenweg is the co-creator of WordPress, founder of Automattic and Audrey Capital, a collaborator of several other open source organizations. There are numerous articles about Matt's story, about his journey towards success. But in this post, we've tried to tell the story in an unconventional way. Because of the huge impact of WordPress all over the world, Matt Mullenweg is a very popular name for many years now. At the age of 18, what he started along with Mike Little, now powers over 31% of the web. However, without further ado, let's jump to the things you might've missed about him. Matt loves using photomatt as his username. Look at his Flickr, Twitter, Instagram or SlideShare account. This is probably because of his love for taking photos. Even his website name was photomatt.net which he changed to ma.tt later. Obviously, he's got a great collection of his photos on this site. Many other arts and subjects are also Matt's favorites; like – culinary, music, or prose writing. He studied jazz saxophone at Houston Independent School District and Political Science at the University of Houston. He used to play the Alto that time but later, he started playing the Tenor too. When Matt was at his high school, the number of news websites was pretty low. He used to read daily blogs written by various professors. He also started blogging on his own using Movable Type. But it was a costly platform. Then he switched to the blogging tool b2/cafelog. b2 was an open source project. So, besides blogging, he started improving his coding skill here. By this time, he had already met Mike Little from the UK over online. Both of them continued improving b2. They decided to build something that combines all the options, but available for every kind of people, and eventually developed WordPress. It's well known that he left school to join CNET in San Francisco in 2004. But before joining there he also visited SXSW, Google, Yahoo and lots of other companies and received a job offer from a couple of them including CNET. He went for CNET because it'd let him retain the IP personally. On top of that, he could be able to spend time on WordPress. Matt started using Dvorak layout instead of QWERTY in his computer when he was a teenager. But the story of this transformation is quite interesting. He was reading a blog where he found a comment linked to a site about Dvorak layout. He started reading about it and got interested. After spending a few moments on the web researching this new layout, he decided to switch from QWERTY to Dvorak right away. He never wanted to switch back to QWERTY. Because Dvorak helped him to type with less pain or stress. But didn't throw his old keyboard away either. After installing the Dvorak layout, he just popped the keys off from it and rearranged them. Matt's father, Chuck Mullenweg was a computer scientist. Definitely, he had a great influence over his son. You may think, it's very common for every boy to follow his father's footprint. But this follow-up was something extraordinary. Chuck often took him to the HAL-PC office. Matt was first introduced to the word: Open-source here. Sometimes he went to his father's office to use the internet. No doubt his affection for computer grew at a very early age because of this. And that affection never faded away though he studied a wide range of non-technical subjects. You may not find Matt drowned into books. But actually, he reads a lot. The interesting fact is, he loves to keep reading 3-4 books simultaneously. As a result, he prefers Kindle or his phone over paper books. He also listens to audiobooks during driving or jogging. He believes books help people being a better human, make them set their resolutions right. Get people to capitalize WordPress correctly, and stop using the fake mis-proportioned W.
On his 30th birthday, Matt Mullenweg started a fundraising campaign to ensure access to safe drinking water for everyone. It is known as charity: water. The campaign raised over $44,000. Besides, he works with several charities and organizations including Archive.org, Alaska Wilderness League, Apache Foundation, Bay Lights, Electronic Frontier Foundation, Innocence Project, and so on. His Audrey Capital invests and helps many startups. So, these are the 10 things we collected for you from different podcasts and blogs of Matt Mullenweg. We'd love to hear from you too about him, or about anything. Feel free to share your thoughts with us. Cheers! Loves learning new things and ideas. Enjoys reading books or watching movies in free time. But ends up spending most times in games & sports. If there is one individual who has really influenced my life, then it’s Matt. I just wonder how I was going to become a blogger without WordPress. The platform has really helped many including myself.